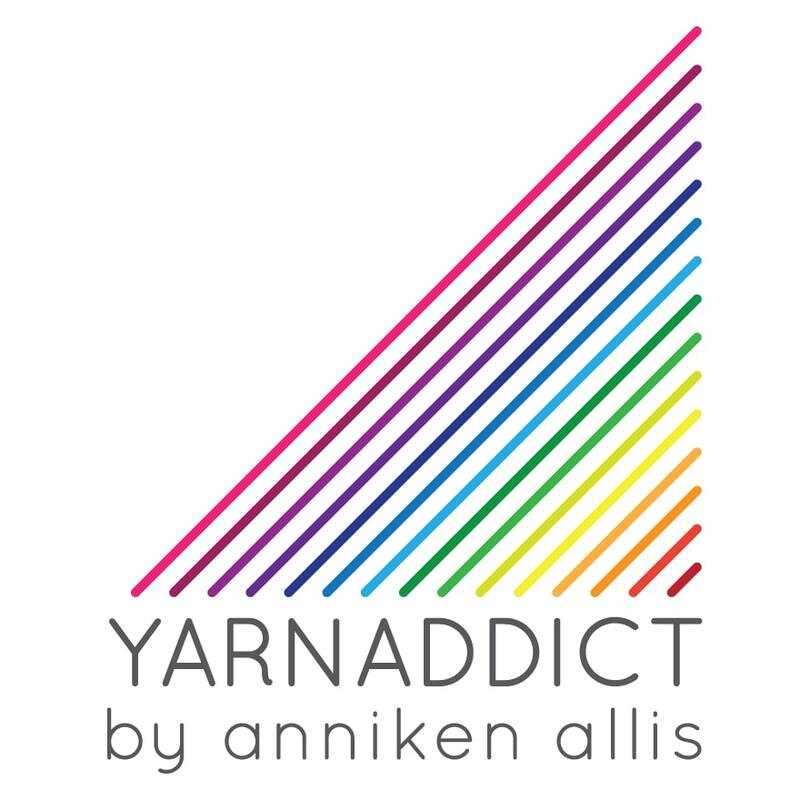 Confessions of a YarnAddict: Monday Mini Tip - Want to make the shawl bigger or smaller? Monday Mini Tip - Want to make the shawl bigger or smaller? For today's Mini Tip I thought I'd tackle a question I get asked all the time - Can I make the shawl bigger or smaller? The answer is yes but how difficult it will be depends on your experience and the stitch pattern and shape of the shawl. Some shawls are easy make larger or smaller and others are a lot more difficult. I won't be able to cover all possibilities here but I'll just cover a few common shawl shapes. 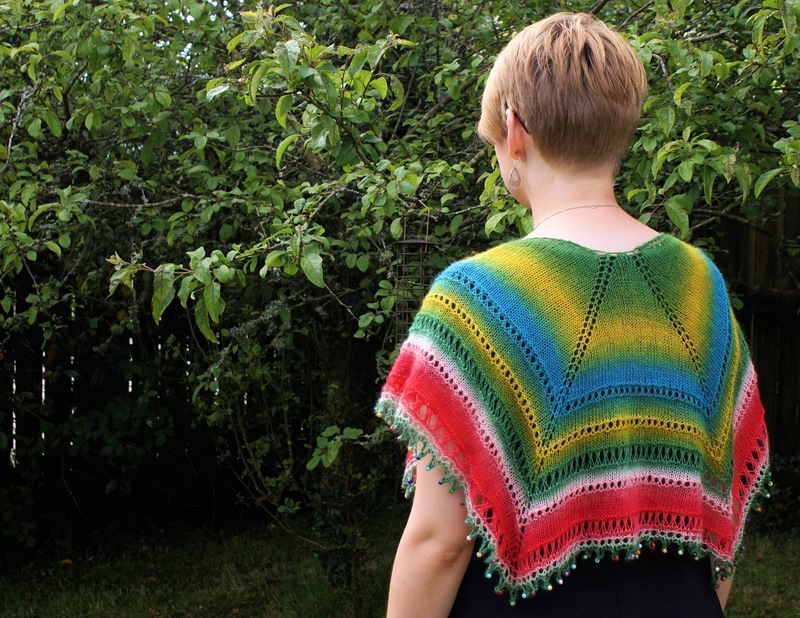 If the shawl has the same number of stitches in the pattern repeat as there are increases in each repeat then it's fairly easy to make the shawl bigger (or smaller). For example, if the pattern repeat is 8 stitches and 8 rows and you increase two stitches every other row, you will be increasing 8 stitches every 8 rows which means you can fit in another 8 stitch repeat for every 8 rows. For triangles and half hexagons, think of each triangle separately. You're looking at the number of stitches increased in each triangle. A top down triangle with a centre spine is made of of 2 triangles and a half hexagon shawl is made up of 3 triangles. On shawls like this you usually just have to choose which one of the stitch patterns (if there is a choice) you wish to work more or fewer of. Violetta is a half hexagon shawl and consists of three triangles. Each 14 row repeat has 14 stitches and on every right side row 2 stitches are increased in each triangle. So for every 14 rows you can work an additional 14 stitch repeat in each of the three triangles. If you're making a rectangle and you would like it wider, just work out how many stitches there are in the pattern repeat and add stitches in groups corresponding to number of stitches in the pattern repeat. If the pattern repeat is 10 stitches and you cast on 68 stitches but you want a bigger shawl, just add stitches in groups of 10. So cast on 78, 88 etc, depending on how big you would like the shawl to be. The same goes for the length. Work out how many rows the pattern repeat is and just work more repeats. This also goes for garments like Lavinia (which is a hexagon with a hole for the head). The rule here is the same as for top down shawls (see number 1). Hexagon shawls consists of six triangles, so just work it out as you would for a top down triangular/half hexagon shawl with a central spine. 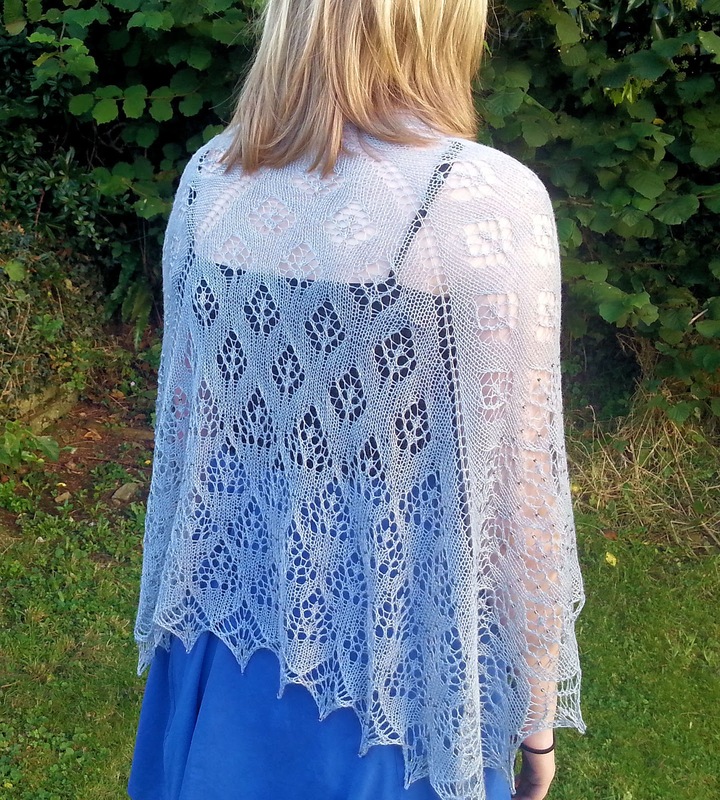 If the circular shawl is a 'pin wheel' construction, the same principles apply as for triangular shawls. If you increase the same number of stitches in each row repeat as there are stitches in the repeat, it's easy to fit in extra repeats. If it's a Pi construction, it's slightly different. Pi shawls have all the increases on just a few rounds. So instead of increasing on every other round, you will increase on just a few rounds where you will double your stitch count. The rounds between the increase rounds, have no increases so the stitch count stays the same on every round. 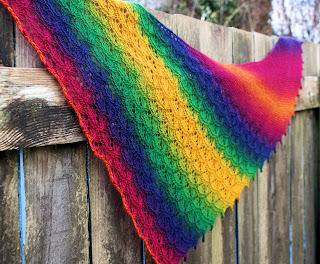 How easy it is to make a Pi shawl bigger or smaller depends on a few things. Pi is the ratio of a circle’s circumference to its diameter and in a pi shawl, the ratio of a shawl’s intended circumference to its diameter dictates the spacing of the increase rounds. For example: You cast on 8 sts and knit 3 rounds. On round 4, you double the stitch count to 16 stitches. You then work twice as many rounds as before the last increase round, so this time you work 8 rounds and double the stitch count to 32 stitches. Work 16 rounds and increase to 64 stitches. Work 32 rounds and increase to 128 stitches etc. If the final increase round was after 40 rounds then the next increase round should be after another 80 rounds. If the pattern only has 60 of those 80 rounds, you can extend the pattern to 80 rounds before increasing again. If you want to extend it beyond this point, you would need to increase again. Be careful about increasing and only working a few rounds before casting/binding off, you will end up with a ruffled edging. Look at how many stitches you increase for each row repeat. If this number is the same as the number of stitches in the repeat, then you can simply work more or fewer repeats. On some asymmetrical shawls, there may be a combination of increases and decreases. You will then need to look at the total number of increases in the whole row repeat. So if it's an 8 row repeat and the stitch repeat is also 8 and you increase 8 stitches every 8 rows then you're fine to just add or take away repeats. Dakota is a good example of an asymmetrical triangle. In Dakota 2 stitches are increased on every other row. On row 8, 4 stitches are cast/bound off. Which leaves 4 stitches increased in total. The pattern repeat is 8. So for every 16 rows (two 8 row repeats) you can work an extra 8 stitch pattern repeat. These are just some common examples. There are so many different shawl shapes and many ways of creating the same shape so it's difficult to create a definitive guide. But the most important thing to think about for shawls where you're increasing or decreasing stitches, if you increase/decrease the same number of stitches in each row repeat as there are stitches in the repeat, it's easy to work more or fewer pattern repeats. Shawls that do not follow this rule can also be modified but it will require you to understand the shaping and the lace pattern. You will probably need to chart out the changes you want to make. Mar Menor is a modified half hexagon shawl. The centre triangle has 2 increases every right side row. But the side triangles have 3 increases every right side row. Also there are no set pattern repeats as such. Which means this shawl is more difficult to modify. There are no set repeats to add, so you need to do more work to make this bigger or smaller. Please ask any questions you have in the comments below. You can see all the previous Monday Mini Tips and other tutorials on my Tutorials page.